I was honored the other day when my friend Laura, from the Mozilla Foundation and Teach the Web, was inspired by my post about hacking a picture book with high school students. She created a Thimble website project that took Hacking a Book in a new direction. The wonderful thing about Thimble is that it is designed to be remixable, so I could not resist the urge and remix Laura’s work, and I went in another direction with it. 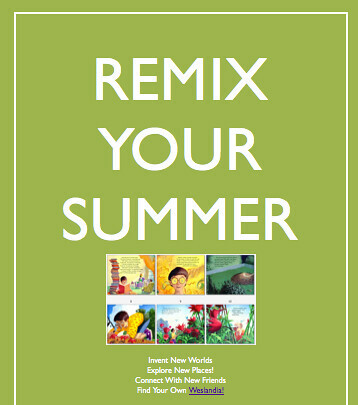 Instead of “hacking the book,” I went with “remixing the summer” and used a book as my inspiration. So, my remix of Laura’s remix of hacking the book is about remixing your summer, with new and undiscovered countries unfolding around you. And while you are there, why not remix it once again? See the “remix” tab on the top of the page. Go ahead. Change it, make it your own and share it back out. Let someone else remix it again. It’s all good. This entry was posted in CLMOOC, TeachtheWeb and tagged #clmooc, #teachtheweb. Bookmark the permalink.